Coffee With Games: Call of Duty? Conduit? GoldenEye? Metroid? 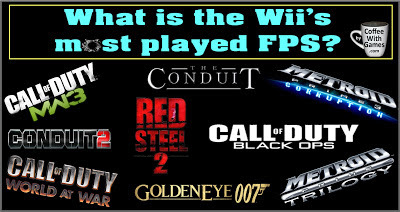 What is the most played FPS Wii game in the U.S.? Call of Duty? Conduit? GoldenEye? Metroid? 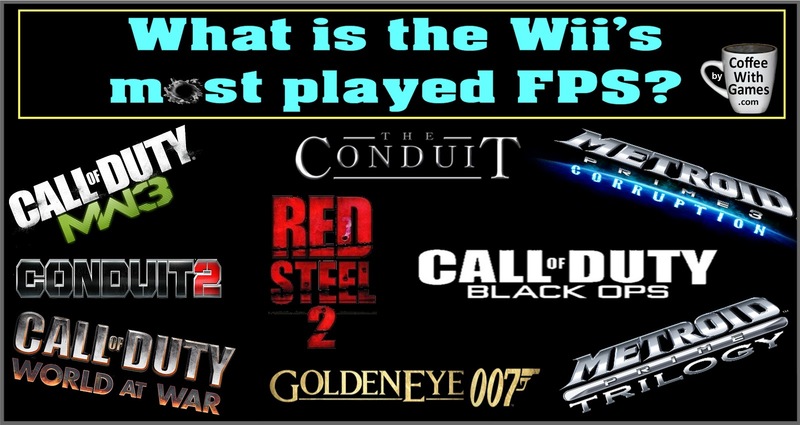 What is the most played FPS Wii game in the U.S.? How most Black Ops 2 players are feeling after the last night of gaming? What. About. ZOMBIES!?!?! 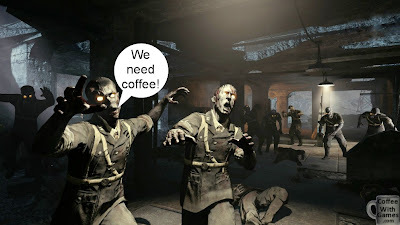 Zombies make everything better (or worse, depending), right? Imagine, Star Wars Zombies...*writes Lucas and Disney to make it happen! I don't mind a good FPS, but I'd much rather a Third Person Shooter like Lost Planet. I didn't play this particular game on the Wii, though I know someone who plays it faithfully. 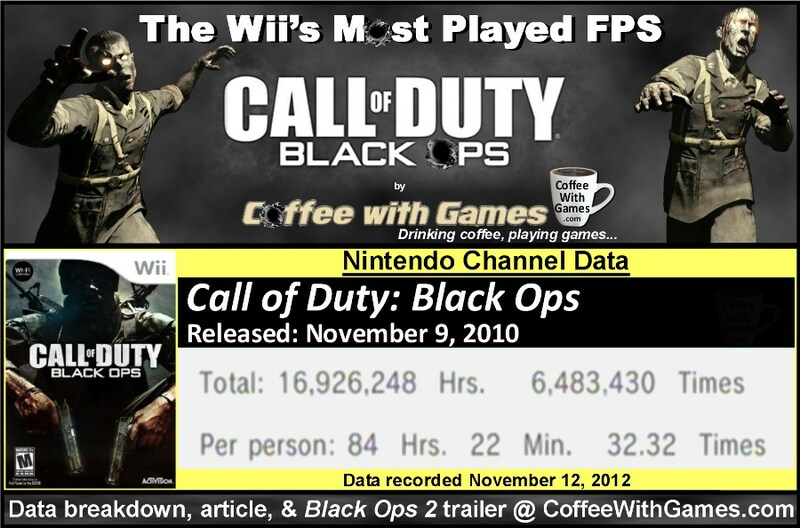 I've yet to enjoy a FPS on the Wii. The classic controller doesn't feel right for the genre (I prefer the dualshock), and I hate pointer controls with a passion. So, needless to say, this is one game I have not played, lol. What are you - Activision? So, I guess you're excited about Lost Planet 3 on the Wii U being "confirmed"? I haven't played many TPS, at least that I can remember now, but I did demo Lost Planet 2 I think on my PS3. Was LP2 the one with the grappling mechanic? I don't follow...what does zombies and Star Wars have to do with Activision (I know there is zombie mode in some COD games, but what else?). OH SNAP! Waits for PC gamers to descend upon CWG....I would say the Classic Controller Pro would be the better option, and the Classic Controller once again shows Nintendo apparently trying something new, just to waste resources instead of making a decent controller the first time. Classic Controller was made for Virtual Console titles with a goal of being a cheap tethered controller, but it was a pathetic controller. Classic Pro Controller was improvement but not much better. Wii Pointer + Nunchuk worked poorly unless software was compensating for player's hands being naturally jittery. Wii MotionPlus + Pointer + Nunchuk which came later worked really well with the Nunchuk being the weakest link left. Having to have the two tethered by cable being another weak point. The PS-Move + Navigation Controller in some ways works better while in others not as good (not as fast/responsive for instance). I'm actually looking forward to seeing how the new zombie mode stacks up, and am on a media blackout of Black Ops 2 and ZombiU now. I actually preferred Wii Point + Nunchuk in my FPS games, and even in Monster Hunter Tri I used the Wii Remote and Nunchuk controls. The one thing the Navigation Controller lacked (I think) was a gyro-sensor, so there was no "shaking" ability with the nunchuk in PS3 games...which I actually liked in Wii FPS games for reloading. Thanks for the comment! 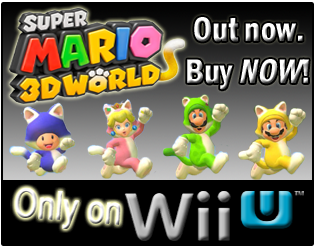 Did you get Black Ops 2, or any plans on getting a Wii U this weekend? I decided to buy Call of Duty Black Ops 2 for the Wii U. I will pick up the new console (deluxe) this Sunday from my local GameStop with ZombiU and then receive Blops 2 in the mail from NewEgg ($12 off and no sales-tax/shipping). I suppose Sandbox games like Saint's Row, Grand Theft Auto, Sleeping Dogs, etc would also qualify as 3rd Person Shooters, but they have driving and other things than just shooting. 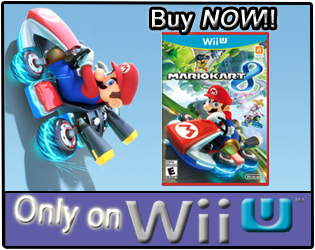 You and I are close to the same with the Wii U. I have the Deluxe Set reserved as well, will be grabbing ZombiU with it and Black Ops 2, but NSMBU will be coming to me from NewEgg with the $12 off deal they had. Perhaps once we figure out the "network id" stuff, we can exchange info and locate each other for some rounds in Black Ops 2. Well, I didn't consider Uncharted a 3rd person shooter, but it did have some of those elements in it for sure. I did enjoy my time with it, and I greatly enjoyed the original Mercenaries back in the day. LOL, zombies are only in Treyarch's COD games, not Infinity Ward's, so Activision may have "approved" it...but the zombie mode(s) was developed by Treyarch originally for World at War, with a "Nazi" slant on it...though they never really explained it, it was fun and played well. Aside from calling it a crappy joke, what @9b06794de58ab1e5ed3e4ccf9038c092:disqus said is correct. Star Wars has nothing to do with it. The lack of patching was an issue in Wii (and 3DS) games, and it's something I hope Nintendo has remedied with the Wii U...not holding my breath on anything though, as Nintendo just really doesn't seem focused these days, and is very spastic with getting updates out. BTW, Conduit 2 has more play-time "Per person" than GoldenEye 007 does, which is probably a reflection of the online multiplayer bringing players back to Conduit 2 more then to GoldenEye. I'm just wondering if the Conduit series will continue, or if HVS is struggling to just stay afloat right now. I would love to play both Lost Planet games and the Dead Space ones as well, heck, even Gears of War to see what all the fuss is about. Can't really get into sandbox games, I've tried to play many GTA games, but it's not something I can stick with for some reason. Spec Ops - The Line is something I need to check out, I know nothing about that game. Yeah, I think it has a grappling mechanic. It's been awhile since I've played, but I've also only played the demos. I hope Capcom releases the other two (as a compilation I guess) on Wii U if they're bringing Lost Planet 3, that would be awesome. I enjoy the "roaming" aspect in the games, and just being able to drive aimlessly around, which is probably why I enjoyed Mercenaries a good bit. "I hope Capcom releases the other two (as a compilation I guess) on Wii U if they're bringing Lost Planet 3, that would be awesome." Let's hope it's not the Mass Effect 3 Wii U issue.